Whether you live in the state of Washington or are visiting, hiking to Camp Muir is a must-do trek that you will never forget. Muir is a popular destination for many day-hikers and an excellent conditioner for those planning an ascent of Mt. Rainier. The trek to Muir should be considered an alpine mountaineering experience rather than just a stroll in the snow. Muir is situated on Mt. Rainier’s south side at 10,080 feet (roughly two miles from the mountain’s crown). It is the highest point you can go on Mt. Rainier without a climbing permit, and the gate to the summit of Mt. Rainier. The trek to Camp Muir is about 4.5-miles with 4,660 feet of elevation gain. Start at the upper parking lot next to the Paradise Visitor Center, following the paved path northeast to the Skyline Trail. The initial part of Skyline trail is wide and paved. It is a very popular trail, but most of the crowd thins out after the first mile or so, where the paved surface ends. Follow the Skyline Trail past Glacier Vista and through a hairpin switchback. In summer, the main trail is mostly snow free for the first 1-1.5 miles. On a clear day, facing away from Rainier you will see a snow-capped peak (Mt. Adams) to the left and a flat-topped, tall rocky surface to the right (Mt. St Helens). The skyline trail traverses a small ridge top, offering terrific views of Nisqually Glacier on one side and a large alpine meadow on the other. You’ll soon pass Pebble Creek, 2.3 miles from the trailhead, which is the last source of water before you enter the Muir Snowfield. Now the real climb begins. It’s a long, straight shot interspersed with rock, sand and piles of volcanic ash in places over the final 2.2 miles and the last 2,800 feet of elevation. 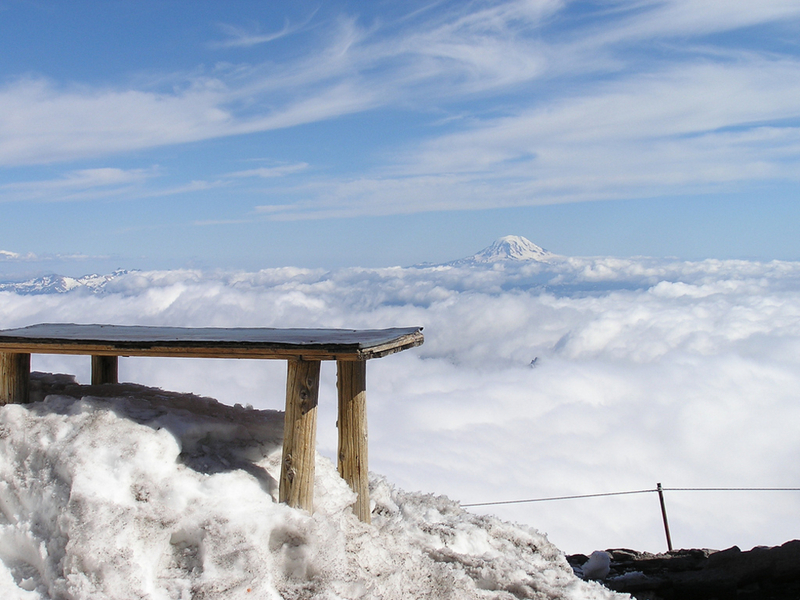 At roughly 9,000 feet, Camp Muir comes into view as you trek up the snowfield. It looks so close, yet is still a ways away –- the last 250 vertical feet will feel never-ending. The way back down is often as memorable as the hike up. Most people choose to slide down on either a large trash bag or a sled that is easy to roll up and pack (it will cut your descent time in half). Otherwise, a controlled slow walk is good. If you choose to slide down, make sure to put on a waterproof shell and pants. Keep in mind that weather conditions can change extremely fast and whiteouts are common. If you are disoriented during a whiteout, it’s best to stop and wait, or turn around if you are ascending. Pack a compass or a small map provided by NPS. Because glaciers surround Camp Muir, it is important to stay on course so as to avoid glacial hazards, like crevasses. Looking for a view? The breathtaking views of hanging glaciers, massive seracs, wide crevasses and thundering rock fall are amazing. You’ll see Mt. Adams, Mt. St. Helens, Mt. Hood, and Mt. Jefferson all around you. The Southwest/Nisqually entrance is the only one open year round. You’ll then have 19 miles of winding roads until you reach the Paradise parking lot. If you plan to camp, park in the upper Paradise lot or the overnight area.